Normally it’s workable for 35 units In each circuit. The system can be extended to more than 200 units. Built-in telephone interface for telephone conference. MIC on number restriction : i/5/open configurable. Auto-off function :The microphone would close automatically in 45 seconds if there is no speech. Equipped with balanced circuit output socket. Unbalanced circuit output socket and both sides circuit output socket for connecting other kinds of equipment. T-type connection, easy to install. Priority button on the microphone. 1. Equipped with three groups of 9P-DIN pugs for system connecting, normally it’s workable for 25 units in each circuit. The system can be extended to 500 units at most. 4. Equipped with balanced circuit output socket, unbalanced circuit output socket for connecting other kinds of equipment. 5. The system works with external amplifier/speaker. 4. The system power supply for ail the delegate units is provided by the main frame at i8v safe voltage. 5. Chairman unit could control the whole process of the conference via the priority switch. 6. Red indicator light on the MIC. 7. 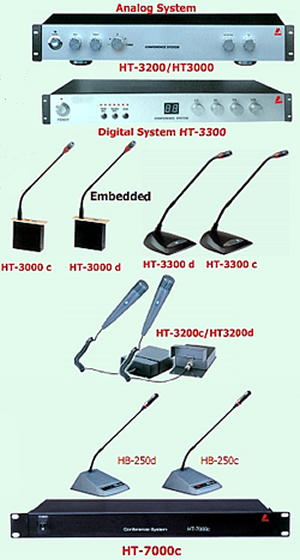 Electret microphone, equipped with windshield cover, extension shaft optional. 4. The system power supply for an the delegate units is provided by the main frame at 18V safe voltage. 6. Electric type microphone, equipped with windshield cover. Extension shaft optional.